Without guessing at the behind-the-scenes upheaval, Titans Vol. 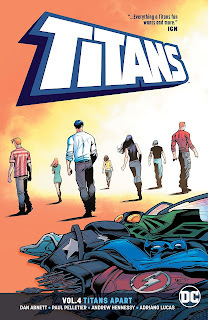 4: Titans Apart feels like a swift -- perhaps even unexpected -- end to Dan Abnett's first Titans run, and it assuredly reads more like filler than a proper ending to this iteration of the book. I don't necessarily mind an Arsenal spotlight story, as this is what Titans Apart is, but five issues of it is a long stretch, especially since the character beats get repetitive and especially since Abnett needs a lot of the heroes to act out of character to achieve the ends. In final tally this story is a reminder of some of the worst-functioning aspects of the adult Titans concept, and it's not a great setup for the next era except for the hope that the next era will be better than this. Again, an Arsenal spotlight isn't the worst thing, and it's especially nice to see extended work by Paul Pelletier and part of an annual by Tom Grummett. Abnett's Roy Harper skews a little older than Scott Lobdell's, which is good too, with shades of the Arsenal of old. I was trying to think how we got to this Arsenal from Marv Wolfman's earlier purple-suited government super-spy; Harper became perhaps a little less imposing when he lead the post-Zero Hour team of junior Titans, but it seems to me he became a joke all at once after Cry for Justice, not gradually, and then the wildly different New 52 version just cemented it. When Arsenal lead the Titans, by the by, was when his romance with Donna Troy made sense; here, it's just been puppy love and banter that never quite won this reader over. It's always fun to see the Titans and the Justice League square off, as at the beginning of this book (and points to Adriano Lucas for actually coloring Batman's cape purple as it should be in the Greg Capullo suit). But the League trying to shut the Titans down requires a variety of leaps of logic, including that the League has any jurisdiction over the Titans at all, that the League blames the Titans for issues involving Donna Troy that are either no one's fault or the League's itself, and also Abnett posits a subservience of Nightwing to Batman that we just don't see reflected elsewhere. It might be one thing if Abnett brought the audience aboard to consider if the Titans should indeed disband, but it's all so specious that it's hard to be invested in the conflict. This continues to the period after the team disbands. Tempest, Omen, and Bumblebee simply disappear, such that the book never feels like it wraps up this team. Donna Troy is prisoner on the Justice League Watchtower for four issues in which it never seems Wonder Woman has a plan (or Abnett has a plan for her) as to how the League will help Donna besides imprisoning her indefinitely. In the most egregious show, Nightwing -- a detective trained by Batman -- can't discern that Arsenal is not high and is on the trail of a threat, and then gets beaten to a pulp by Arsenal. Along the same track, neither can Batman discern the threat that Arsenal's facing from Donna Troy's report, despite lack of other evidence. Though I recognize its incumbent upon Abnett to create drama here, that Roy Harper and Donna Troy should be the smartest people in the room amidst the entire Justice League and the other Titans stretches believability indeed. As is the way of soap opera storytelling, the often-impressive Justice League teams of the past thirty years have inevitably dissolved into busyness or infighting ahead of their collapse and relaunch; it makes it tough to get too excited about the "New Justice" era knowing these Leagues too will fall. It's the same for these Titans, who got less than 25 issues before they broke up; after Wolfman's Titans, and Devin Grayson's, and Judd Winick's, it's hard to see the appeal of these childhood friends working together, knowing they'll eventually split -- and different from the League, buffeted by events in their own titles, that the Titans often split for angst-ridden interpersonal differences makes it doubly exhausting. It's hard to see Abnett's next iteration of Titans -- not, for the most part, childhood friends -- even as Titans as opposed to just "team being lead by Nightwing"; at the same time, the lack of some of the things that make these teams "Titans" might be better this time around anyway. Arsenal Roy Harper is in the news these days, and that's another reason it's worthwhile he gets his own adventure. But Titans Vol. 4: Titans Apart reads like an expanded story from DC Universe Presents, where Harper got some time in the sun back in the day. The sole focus here, benching or making ill-use of the other inaugural Rebirth Titans, seems an odd use of the last issues of this era of the book -- again, so much so that it mainly reads like story to fill up the pages. Titans Vol. 3: A Judas Among Us was a bright spot in this often troubled title; readers could as easily assume the team split up between the pages and jump from that volume to the next. It was though Abnett was trying to showcase the team's incompetence. The Titans are a skilled seasoned team but the JLA treated them like they were a second rate Young Justice. Where was the respect or loyalty? And Wonder Woman and Manhunter's condescending attitudes were definitely oft-putting. And why wasn't Garth part of the wrap-up? People tend to forget the whole Titans legend began with Richard, Wally, and Garth. Great art poor characterization.